A new feed system for Baker Perkins’ powder coating and industrial extruders can lead to a throughput increase of up to 34%. Baker Perkins’ patent-pending MAX³ feed system features a re-designed feed port and screws to improve flow of material into the extruder barrel and air out of it. 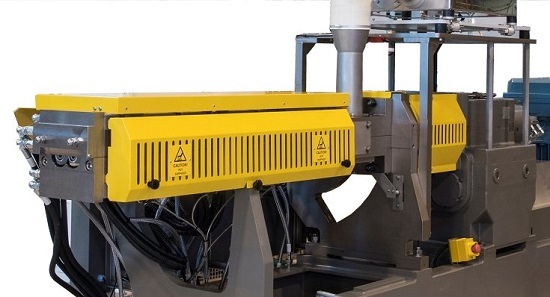 The innovation addresses a long-term problem within the industry of restricted output and torque surges caused by material building up in the extruder feed port. This occurs when particles hit the intake screws and ‘bounce’ back into the infeed areas, rather than flowing into the machine. As material builds up in the infeed area, it becomes progressively more difficult for air to escape, further reducing the flow of material into the extruder barrel. Torque load increases until the blockage clears – and the cycle repeats - or the machine cuts out. Up to now, manufacturers have dealt with the problem by reducing the feed rate of material into the extruder, inevitably cutting output. In production, the new MAX³ system is providing increased output of as much as 34% across all formulations. A major benefit is that lightweight, low density materials are now handled more efficiently. 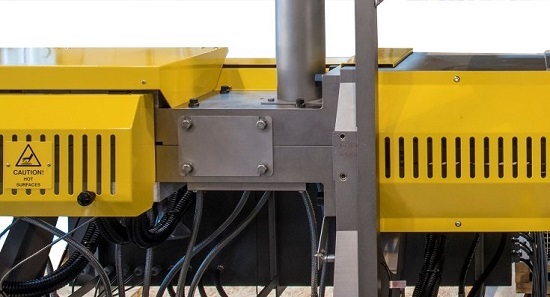 This eliminates the need for side feeding, reducing capital cost, floor space and running costs: side feeding forces product into the screws, causing high levels of wear. The MAX³ system can be retrofitted to top-feeding machines, and side-feeding machines can be converted to top feeding. The MAX³ is available with Baker Perkins’ MPX30, 40, 50, 65 and 80 barrel diameter extruders and also the MPX24 Integra laboratory and small batch machine.